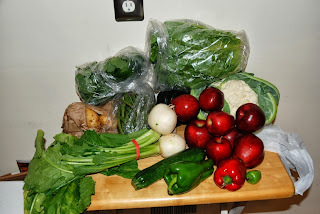 Yesterday the kids and I went to the local synagogue to pick up our first fall CSA* order. I can't deny it, I was and still am absolutely giddy about the whole thing. I had forgotten we also got an egg share, so I picked up a carton with 11 eggs as well. As you can sort of see, we got the following: a head of Romaine lettuce; a monster cauliflower; a zucchini; a red, a green, and a tiny-maybe-hot pepper; a small bag of potatoes; a bunch of apples; a bag of green beans; three enormous radishes and greens; a bag of lemon verbena; an acorn squash. The fun part is now we re-do our meals list for the week to work in the bounty. And of course we're adding salads to our lunches. With lemon verbena oil as part of our oil and vinegar for dressing! * CSA = community supported agriculture, wherein a group of people put up a bunch of money before the planting begins, and then everyone shares the risks and rewards of a harvest. They are nearly always local and usually use more organic methods than agrobusiness. The synagogue bit - just happens that they have a relationship with the CSA and people can join the CSA through them. I haven't joined the synagogue, although it is a possibility for the future.